Also known as micro-injection or tree vaccination, this treatment involves the direct injecting of insecticides or fungicides (or both into) the tree trunk. 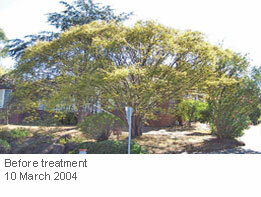 Trees that have been injected look more vigorous and healthy than others nearby that have been soil injected. Clients often comment that their tree has improved leaf colour and leaf size compared to when it was soil injected in past years. Designed to protect against damage & defoliation for two or more years. Has a higher level of active ingredient available in the canopy, ensuring a superior level of control compared to soil injection. Chemistries are also highly stable within the tree compared to soil injection. Ideal for all environment situations. Complies with and exceeds OH&S standards compared to conventional treatments. Is the most environmentally friendly method known and is safe around children, pets and riparian situations. Soil injection involves injecting an insecticidal solution around the root zone of the tree, and is carried out from May until October to potentially achieve two years protection targeted at the canopy. 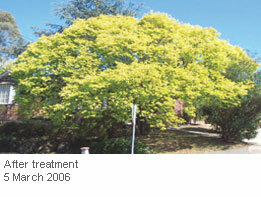 The treatment may take up to ten weeks before complete uptake occurs. 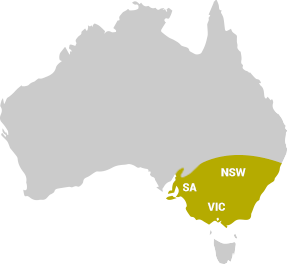 Even distribution of the injection sites is essential for an even uptake. Chemical is taken up by the root system and distributed via the vascular system to the canopy and beetles that ingest a small amount of leaf material cease feeding immediately. The chemical reacts within their nervous system resulting in imminent death. While Imidacloprid is one of the safest insecticides available with a very low vertebrate toxicity, it is highly dangerous to aquatic and soil invertebrates and avoidance of waterways is stated on the label. Soil injection is the treatment option least favoured by Elmsavers, due to its more adverse environmental impact. While our treatment now involves injecting – a newer and environmentally safer Neonicotinyl – Elmsavers is phasing out the use of soil injection treatments in favour of more eco-friendly solutions such as tree injection. Soil injection failure can result in stressed trees that have severe larval damage. The soil injected insecticides damage the soil, micro flora and also kill earthworms at levels as low as 4ppm. Trunk-injected trees have a higher level of active ingredient available in the canopy, ensuring a superior level of control compared to soil injection, while chemistries are highly stable within the tree as compared to soil injection. Tree injection is the only method allowing for precise dosage and delivery of pesticide., and uses lower levels of pesticide, below Label Rate. Tree injection unlike soil injection is target specific, soil injected insecticides are taken up by surrounding plants posing a serious risk to bees. 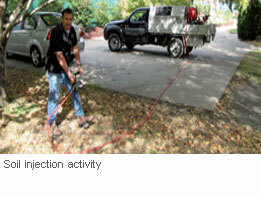 Tree injection is ideal for winter flowering wind pollinated species like elm and plane trees. Soil injection square meter application rate exceeds the label rate for in-furrow applications by a Huge Margin, up to 39.2 times per square meter. The label (WHP) for in furrow applications is 21 weeks for grazing. Public perception of tree injection is positive; and the treatment is scientifically proven to improve tree health and induce systemic acquired resistance. Elmsavers is the recognised leader and innovator in tree injection and the only company to offer a minimum 2-year or extended guarantee with this method. Our calibrated high dose treatments protect trees for three and up to seven years with our extended guarantee. The company is the first all-year-round tree injection specialists to perfect Neonicotinyl injections in the dormant phase.